Sergeant Bowe Bergdahl will be questioned by U.S. Army investigator Major General Kenneth Dahl today in San Antonio, Texas, according to the BBC. During the interview, Bergdahl and his lawyer, Yale Law Professor Eugene Fidell, will meet with Dahl to answer questions about the circumstances of his capture. Fidell and his client spent Tuesday preparing for potential lines of questioning. "And after that the Army Staff will have to make some hard decisions about what ought to be done," Mr Fidell said to KSAT. Dahl will then make recommendations to the military about how to best proceed. 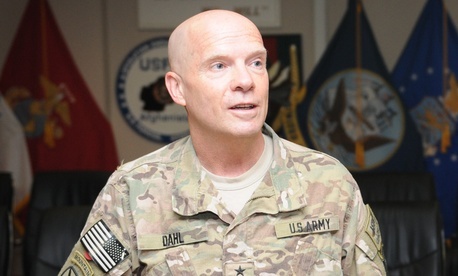 According to NBC News, Dahl's recommendations could range from no charges of wrongdoing to dismissal from the military to court-martial resulting in jail time. Bergdahl has been working a desk job at Fort Sam Houston since his return to the U.S. He was previously undergoing evaluation at a U.S. military hospital in Germany. Although the death penalty is still a possible legal outcome to a U.S. court-martial, the last serviceman executed by the American military was John A. Bennett in 1961. There are currently six men on the military's death row including most recently, Major Nidal Hasan who killed 13 people in a shooting rampage 2009 at Ford Hood. Bergdahl was held by the Taliban for five years until he was exchanged in May for five top level Taliban generals being held at the U.S. military prison at Guantanamo Bay. President Obama's announcement of the release was met with immediate criticism. Many suggested that the price was too high for someone thought to be a deserter. Others criticized the President for not informing Congress before making the deal.